Two bulldog puppies with spina bifida received a stem cell treatment at UC Davis in California meaning they can now run, walk and play. The puppy siblings Darla and Spanky were treated with a therapy developed to help preserve lower-limb function in children with spina bifida, according to a UC Davis news release. 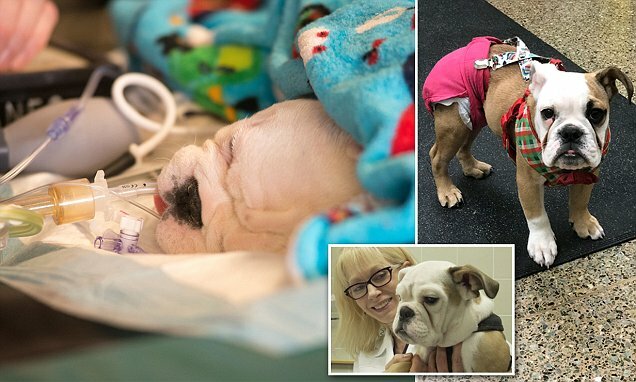 The puppies were transported from Southern California Bulldog Rescue to the UC Davis Veterinary hospital when they were 10 weeks old because spina bifida made it impossible for them to control their back-ends. Spina bifida occurs when spinal tissue improperly fuses in utero causing cognitive, mobility, urinary and bowel disabilities. Approximately 1,500 to 2,000 children in the U.S. are born with the condition each year. Dogs with the birth defect are typically euthanized as puppies because they have little control of their hindquarters. An adorable video shows Darla and Spanky showing off their ability to walk, run and play after their post-surgery checkup at four months old. They were the first dogs to receive the treatment, this time using canine instead of human placenta-derived cells. 'The initial results of the surgery are promising, as far as hind limb control,' veterinary neurosurgeon Beverly Sturges said in the release.